Headlines > EU affairs > Current page:: Climate change: "Business as usual with a bit of green won't get us there"
UN climate change envoy: "Business as usual with a bit of green won't get us there"
Tackling climate change will be a key issue for the newly-elected European Parliament and for the new Commission, which will take office later this year. 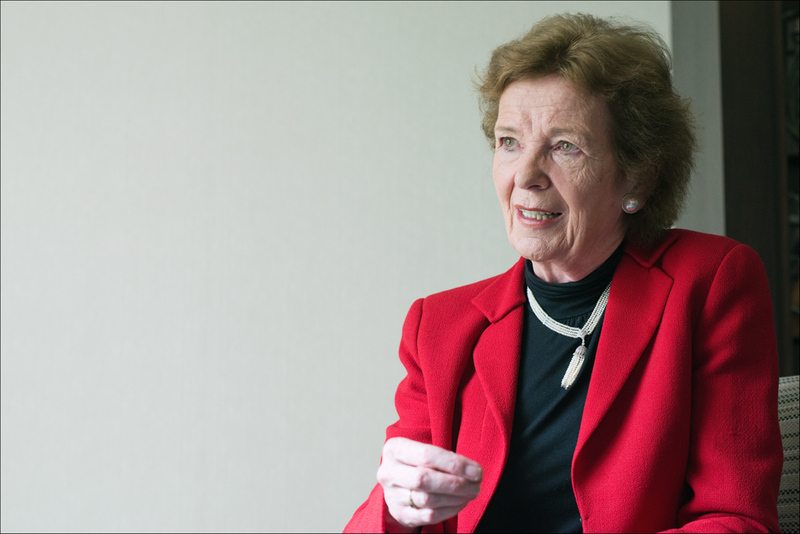 One person who has no doubts about the urgent need to galvanise climate action is former Irish president and current UN special envoy Mary Robinson. While in Brussels to meet with Parliament President Martin Schulz, she urged European politicians to show leadership on the issue. The flash flooding across much of the Balkans earlier this year and the devastating forest fires of recent summers in southern Europe showed that EU countries are not immune to the impact of climate change. Speaking ahead of her meeting with Schulz on 10 September, Robinson said: "It is becoming clear to people even in more developed parts of the world that climate is beginning to really affect them. It's resulting in extreme weather conditions, more flooding, and more droughts." The UN envoy feels that despite the many issues that European countries have to deal with, this is the overwhelmingly urgent issue: "It must be on the front burner of EU leaders, particularly at the European Council meeting in October. It is very important that leaders adopt the Commission package for a 40% reduction by 2030." In February the Parliament voted to require member states to meet binding national targets on renewable energy, energy efficiency and greenhouse gas emissions. Robinson is of the view that the Parliament plays "an increasingly important role" in the efforts to combat climate change: "It will have to implement the package that European leaders adopt at the October Council and I'm glad that many MEPs have a very good sense of the urgency of climate." Robinson feels that it is in Europe's economic interest to face up to climate change: "It is about jobs for the future. In the self-interest of European countries they need to be ambitious. I know that there is talk now about a Europe-wide energy policy; I think it's important that it be about renewable energy insofar as possible." Robinson served as UN high commissioner for human rights from 1997 to 2002 and, in her view, global warming is very much a human rights issue. She outlined how climate change is undermining development policy: "The efforts being made on development aid could actually be reversed by climate so we need to urgently address mitigation of climate but also help poorer countries, with community resilience and the transfer of technologies. We could change the lives of the 1.3 billion people who have no access to electricity because solar lighting has become much cheaper." The former Irish president said she hoped that the UN climate summit taking place in New York on 23 September would prove to be a turning point in the combat against climate change: "I think more and more we need to take the important decisions, starting at the climate summit. What I've learned is that business as usual with a bit of green won't get us there. We have to actually change course and I hope that European leaders will give leadership on that."